We create legends. They are sometimes an anomalous natural occurrence that exists outside the realm of possibility, but they don’t always have to be. The way they become legendary are through stories being passed on from person to person until enough people have heard it, know it, and revere it. 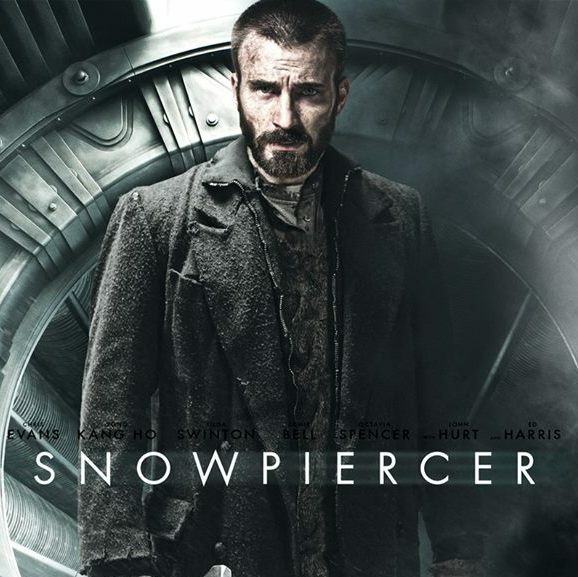 In this summer season of blockbuster brutes, Snowpiercer is a refreshing cool breeze that has all the makings of being a legend, even if the word hasn’t spread on it just yet. The world ends as it has in many other films, but this genocide is caused when an experiment to try and counteract the effects of global warming goes horribly wrong and causes an eternal ice age. The only survivors of the human race are those on the Snowpiercer, a perpetual-motion engine train that circles the globe in an attempt to keep from freezing still. The inside the train is a Marxist caste nightmare with each section of the train housing a different group of people, going from the front, high class society all the way to the end of the train with all of classless and destitute. At the very front, the trains creator and conductor Wilford (Ed Harris) guides this new world. The inhabitants of the end of the train are forced to live in a very condensed, slum-like area with limited food rations. There are armed guards making sure everyone stays in line. Whenever the front section needs a person with a special skill set, or even children, they are taken from the back, regardless if they consent. That all changes when Curtis (Chris Evans) plans a revolt (with the help of an unknown source from the front of the train) to liberate the back section of the train. With the help of his spunky sidekick Edgar (Jamie Bell), enraged mother Tanya (Octavia Spencer), and the wise Gilliam (John Hurt), who has extensive knowledge of the previous failed uprisings. After an incident involving a shoe, a frozen arm, and a rousing, disillusioning speech by front-trainer and second in command Mason (Tilda Swinton), everyone’s patience is depleted. Curtis sees his opening as soon as he discovers the armed guards have no bullets in their gun. Making it past their train car, they follow the lastest instruction from their mysterious benefactor and free a locked up security officer to help them on their way forward. Namgoong Minsoo (Kang-ho Song) was originally locked up for his addiction to a drug called Kronol, which Curtis uses to bribe him into cooperation. The journey so far has been a walk in the park compared to the treacherous journey that lay ahead. Based on the French graphic novel Le Transperceneige, Snowpiercer gives us a glimpse at a fully fleshed out post-apocalyptic society with enough social commentary to make this film a full course meal in a sea of popcorn-flick summer blockbusters. Emphasis on the word “bust.” In a film that could easily have failed, only visionary South Korean director Bong Joon-ho could bring this dystopian, allegorical society to life and make it as profound and engaging as he did in The Host, combining stout political commentary with monsters. Joon-ho is anything but subtle in his approach to the story, and that is exactly what is needed to bring there Orwellian themes to life. The film could easily go off the rails, but what keeps it on track are the performances. Chris Evans shines through as a non-Marvel based leader, which seems to come pretty easily to him. Each actor plays to their strengths, which means the casting was impeccable. Most notably was Tilda Swinton’s character, whose eccentricity and quizzical mannerisms bring a needed note of humor in an otherwise completely serious toned film. Never discount how much well placed and appropriate comic relief can elevate a film. The visuals and cinematography, though not at the caliber of a Michael Bay extravaganza, are still explosive enough to make them stand above any action film that’s come out this summer. The fight scenes are so artistically choreographed that you feel as if you’re watching a violent dance recital. The most disappointing thing about this film is how few will see it, since most will be over-indulging in the copious amounts of blockbuster junk food films currently out. I would easily consider it one of the best action/sci-fi films of the year, and a must see for any fans of the genre. The good thing about legends is that withstand the test of time, and Snowpiercer has the makings of a long lasting cult status film. This dark horse is still in the race. Previous ArticleJon's Movie Review: A legend lives on through "Life Itself"